It was a movie that shouldn’t have worked. Who in their right mind would try and make a romantic comedy where the lead actor and lead actress hated each other? Who in their right mind would ask Depression-era audiences to sympathize with a spoiled heiress who begins the film undergoing a hunger strike? Who in their right mind would abandon the lavish escapism of 1930s cinema that moviegoers so hungered for in favor of a story that threw its leads into the starving underbelly of American poverty? And finally, who in their right mind would predict that such a film would not only become one of Columbia Studio’s biggest hits, it would also lay the groundwork for the screwball comedy genre and become the first film in history to win the Big Five Academy Awards: Best Screenplay, Best Actor, Best Actress, Best Director, Best Film? 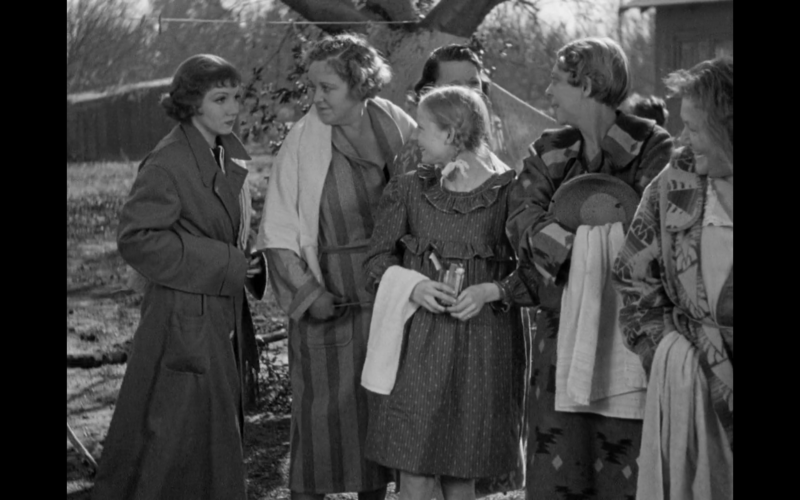 Frank Capra’s It Happened One Night was a film that defied expectations to such an outrageous extent that the cinema has never fully recovered from its impact or influence. 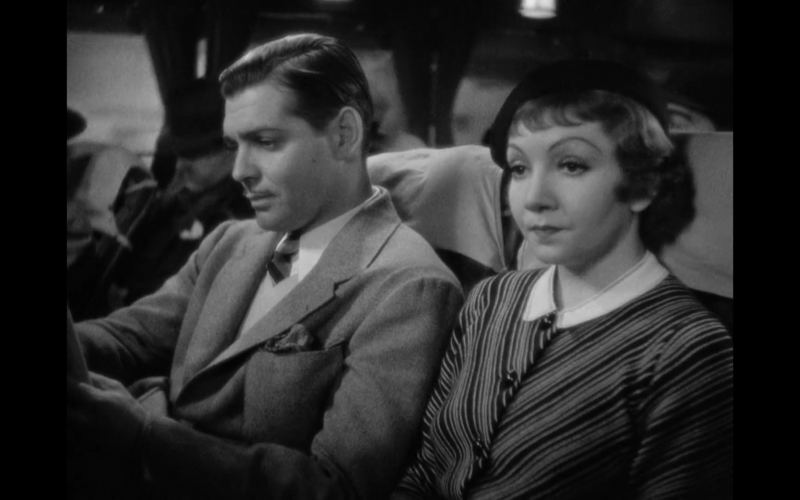 The film centers on the relationship between wealthy heiress Ellie Andrews (Claudette Colbert) and Peter Warne (Clark Gable), a recently unemployed newspaperman. Ellie runs away from her disapproving father in Florida in order to meet up with her eloped husband in New York City. Peter agrees to help the naive Ellie make it to New York City (no mean thing, considering they have several thousands miles to go and only a few bucks between them) if he gets exclusive rights to her story. After surviving many hardships, they get to New York City but discover that they have fallen in love. A more in-depth evaluation of the story isn’t necessary, for the true genius of It Happened One Night lies in its subtext and the remarkable chemistry between its two lead characters. Unlike the more traditional romantic melodramas of its time, the film predicts the rise of screwball comedies by revolving around class and gender reversals. In a move that nobody in the early 1930s would have missed, the film begins with its two leads economically humbled and broken: Ellie is cut off from her father’s fortune, Peter has lost his job. Their journey across the country mimics similar ones undergone by millions of Americans seeking employment or better living conditions during to the Depression. During this journey, both Ellie and Peter find themselves swapping gender roles. The most notable example is a scene where Ellie wakes up in a shack wearing men’s pajamas to find Peter tending the house and cooking her breakfast. Today such a scene seems positively benign. But to audiences in the 1930s Ellie might as well have been wearing a business suit and Peter a French maid uniform. Peter is frequently shown to be impotent in his attempts to aid or help Ellie, failing as a Hero (he isn’t able to heroically stop a thief from stealing her bags at a bus station), a Hunter/Gatherer (the only food he can scrounge up for them is a few withered carrots), and a Provider (he is fired from his job due to incompetence). The film’s most famous scene further underscores these reversals. Stranded in the countryside, Peter is emasculated by repeatedly failing to hitchhike. Amused by his failure, Ellie succeeds on her first try to stop a car by lifting her skirt and flashing her leg. It is the power of the Seductive Feminine, a well-sculpted piece of naked flesh, that proves more reliable and powerful than the Assertive Masculine, a waggling thumb and insistent smile. If you equate Peter’s erect thumb and the pointy carrot he keeps shoving into his mouth during the scene (an act that would prove to be a chief inspiration for the character of Bugs Bunny) as phalluses, a poignant Freudian reading of the scene can be parsed out. 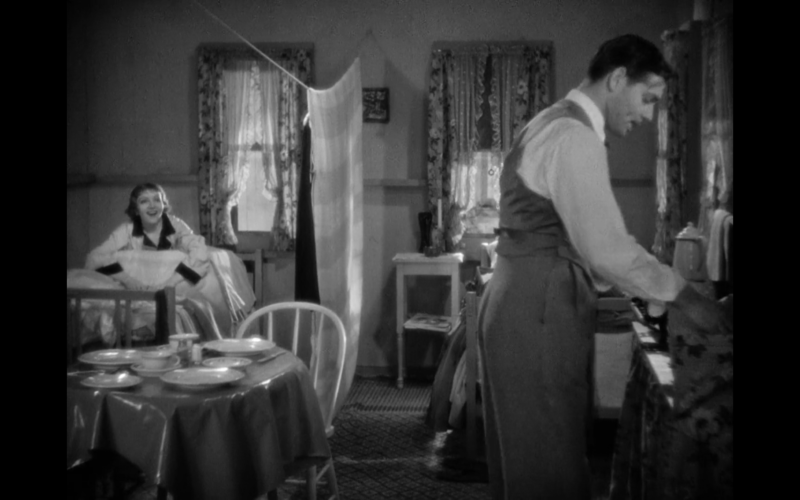 But in spite of everything, It Happened One Night would have fallen flat on its face if not for Gable and Colbert. It’s hard to imagine that the two initially couldn’t stand each other. But, blessedly, they warmed up and managed to project the full electricity of their personalities with magnetic effect. Gable, with his cocksure smile and insouciant superiority to mere mortals, was the perfect counterpoint to the more calm and restrained Colbert. The casting of Colbert was particularly inspired as any other actress associated with the screwball comedy would have mucked up the relationship dynamic with Gable: Barbara Stanwyck would have eaten him alive; Carole Lombard would have annoyed him to death; Katharine Hepburn would never have had to run away from her father in the first place. Colbert’s retorts and comebacks had the spark of smirking, high-class sophistication that Gable could work with instead of merely reacting against. Colbert may not have been evenly matched with Gable, but that was the point: they weren’t supposed to be. It Happened One Night was a film about how two poorly-matched yahoos who should have known better succumbed to the only force greater than money and power: love.